Sandwich Chimney Sweep was founded in 1978 when the energy crisis of the 70’s was in full stream. There was a need for a chimney professional to take care of all of these chimneys that hadn’t been maintained for years. 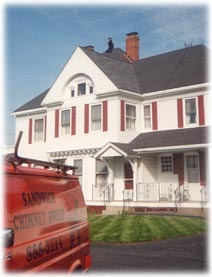 Over the years Sandwich Chimney Sweep has become known for their expertise and knowledge of chimney maintenance. This is a family run business and great pride is taken to assure that all of our customers get the very best service possible. We have over 30,000 customers to verify that fact. We are certified by the Chimney Safety Institute of America. We also hold Construction Supervisor and Home Improvement Contractors licenses. We also carry full insurances for our customers and employees. Our top technicians have been with us for over 20 years and take the same pride in their work and customer relations as we do. Our distinctive orange trucks have been seen all over Cape Cod for many years and will continue for many more. You, our customers have always been #1 with us and you will find that we will provide you with honest, reliable and professional services every step of the way. So give us a call today! Our office hours are Monday through Friday from 9 am to 5 pm.